“How?” Was the first question that popped out of my mouth. The first time I posed this question, I happened to be talking with a college student who had just told me my goal was to stop with my horse standing square. I could see her searching her mind for where to begin. I remember she mentioned stopping the horse from your seat but I’m pretty sure we both decided to stop there. Why do square halts happen? Soon I found myself both searching for articles to read as well as paying attention to what my horses were already doing. I knew some of my horses stood a lot more square than others but I had never paid that much attention. What was different between the ones that stood square and the ones that didn’t? I admit that it became a bit of an observation ‘challenge’. I watched my own horses, I watched other horses being ridden and I watched videos. 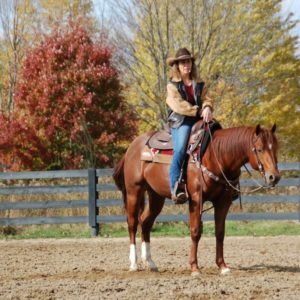 I was watching any horse that came to a halt in any discipline, pasture, field or trail ride. There had to be a common thread. Then I found it…in the last place, I had planned to look. A reining futurity. Every year my husband and I watch the reining futurity at the Quarter Horse Congress in Columbus, Ohio. Hundreds of horses are shown and the top thirty or so are brought back to the finals. It was there, watching these three-year-olds show, that I had my breakthrough on the square halt. I admit it was on accident. I was sitting there talking with friends, watching the runs and enjoying my time but apparently the ‘challenge’ I had given my brain was still running in the background. Somewhere around the middle of the class, I noticed something. 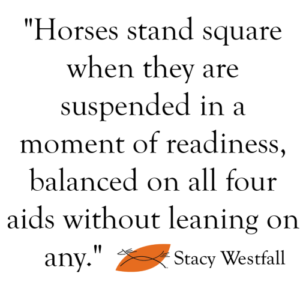 Over 90% of the time when the horses came to a halt in the center of the arena from their circles…they were standing square. Picture perfect square. When this observation first occurred to me I thought it was a fluke. It must just be this horse. Now the challenge was in full gear! I watched as three-year-old after three-year-old came to a perfectly square halt. And the crazy part for my brain was that I KNEW these riders didn’t care AT ALL if their horses were standing square at that moment or not. Why then were they all standing so square? 1) They are standing square as a side effect of the rest of the training. 2) They are standing square because they are in perfect balance between the expectation of standing still and the expectation of moving off with a purpose. The maneuver that most consistently had square halts was the transition from a small slow circle (around 15 meters) to halt. At that point in the pattern, the horse knew another move was coming but they were unsure what it might be. The riders had the horses tuned in, dialed in, tuned ‘up’ or whatever phrase you might use to denote that the horses were ready for whatever might come next whether it would be a spin, back up, lead departure or pretty much anything. The horses were suspended in a moment of readiness. Balanced on all four aids without leaning on any. At home, I noticed it worked like a charm on the horses I had that could perform at slightly higher levels. There seemed to be a connection between the advancing of transitions both up and down that caused the square halt to happen…but something was still missing. But what about less advanced horses? 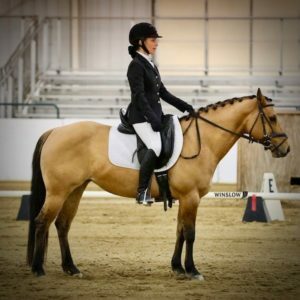 How do you get a square halt in dressage or western dressage? On greener horses, the task felt more difficult. They lacked the ‘crisp’ responses and at times the halt was asked for from slower gaits. While this seemed like an easier transition…it often made achieving square more difficult. 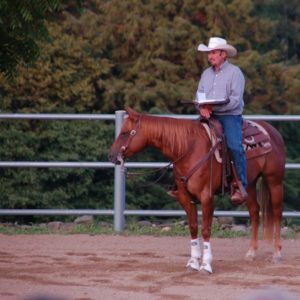 At one point in my career, I trained horses for showmanship, which is an in-hand class where the horses must stop and stand square. The method of teaching the horse to square up was a simple concept that required only one thing; hundreds and hundreds of repetitions. To ask for square the handler needs a clear goal and a method for making corrections. The same ‘rules’ apply when riding. On my less advanced horses, I installed the rules that when I stopped, if I felt they were not square I would cue for a slight forward step to hopefully correct whichever hoof had been left behind. By only correcting the steps with forward motion it reduces the number of possible corrections and maintains the idea of forward thinking. If the small adjustment worked, great! Sometimes I dismounted right there to reward my horse. If it did not work, no problem, I would trot off and do it again. This correction was improving two things; the horse’s anticipation of forward with intention would be increased and the next time I asked for a small step I was more likely to get it. Now I was onto something. My transitions were improving, my awareness was improving and my halts were improving. Who knew that a combination of showmanship training and watching reining horses circle was going to improve my dressage halts? Not me…which just proves you can find inspiration in the strangest of places…as long as you are looking. Horses stand square, suspended in a moment of readiness. Balanced on all four aids without leaning on any. This is what I have found over the years. I do teach my horses to square on the ground and understand what the word square means. Before I start them undersaddle. But really here is what I have found teaching riding and it seem to work . I have found it’s about the timeing of the aid . However it helps when the horse is on the bit moving forward in balance with a steady tempo. But i am finding it works know matter what. Most of the time with my student and horses. The horse should know how to halt from your seat and wt aids. For we all know when you pull back on the rein it changes the balance. In the trot you ask for the halt when one of the front leg is swing forward . 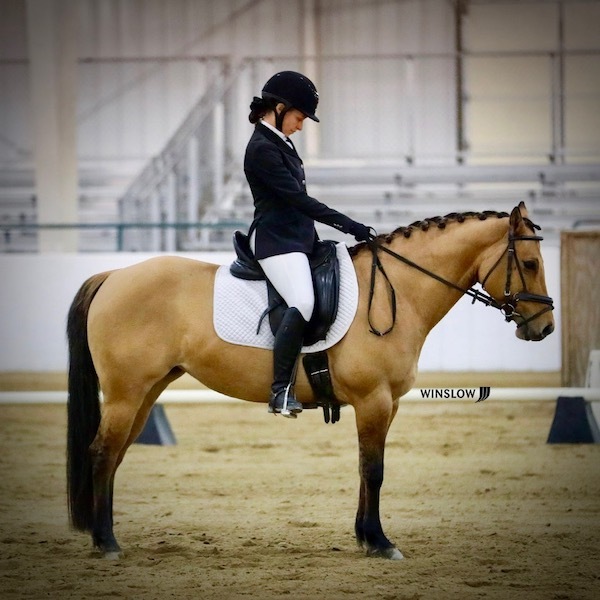 With my students I will start saying now , now when the outside front leg is swing forward as you feel the horse start to halt you add your sit for a second .Like the great riding master Walter Zettl said ride a downward transition as if it were a upward . Now in canter Walter would say apply the halt aid on the up.. The Walk I don’t know when yet maybe some one will . First I need to figure out how to square him up in hand. I have received conflicting advice. Should I back up the horse into position or make him go forward? I’ve tried both. Either way, I am not getting much improvement…. now it seems that forward would be best. Your thoughts? Either will work as long as you are consistent. In hand, I leave the right hind in place, adjust the left hind to match, then set the front feet. The order is important…but you can pick the order. You could always rear then the front. Or front then rear. Or left then right. The pattern doesn’t’ matter…you being CONSISTENT is what is important. Omgosh, that totally made sense finally! Thanks Stacy. You’re welcome! I knew someone out there would think like me!